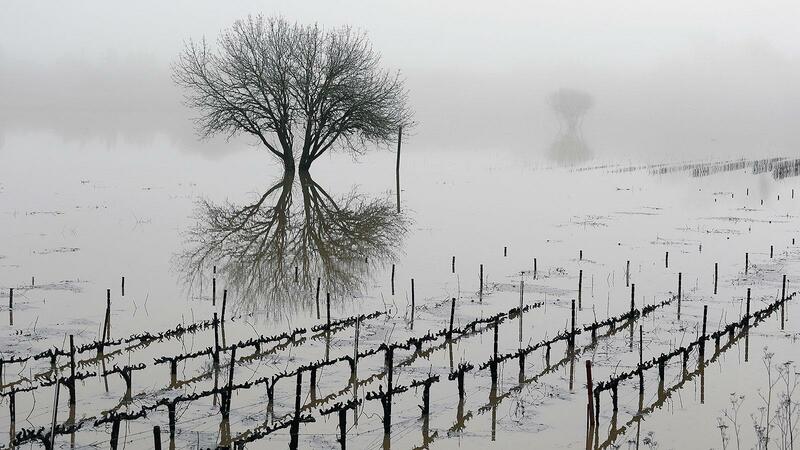 Sonoma vineyards are soaked at the moment, but questions remain for the long-term future of California winemaking. So far, minimal flooding has occurred in the usual places. There are, for instance, sand bags aplenty in Napa's downtown area and for building along the Russian River. I visited the Napa River-Napa Creek flood protection project Sunday night as a big storm passed through and it is performing as designed, keeping the muddy water flowing without backing up. So far, anyway. The snowpack and snowmelt are on everyone's radar, as they're so vital to the state's water health heading into the summer. Ground-water saturation means short-term water concerns take a backseat to longer-term solutions for water use. Despite what it looks like outside or on TV, the drought isn't over. For the past three years, rainfall has been well below what is hoped for to support the state's most valuable natural resources. It's been exciting seeing how green and plush lawns and gardens look now with a deep soaking. The steady rain has replenished the ground water and will aid grapes once they head into the upcoming year. Roots won't have to search as deep to find water. In global wine circles, weather is a front-row topic. Everywhere I've visited the past few years—Europe, South Africa, New Zealand—the impact of climate change is the top concern. Vintners I meet at events from different areas feel the same. Temperatures have been steadily rising, leading to earlier, hotter harvests and riper styles. It's changing wine around the world.